OpusFSX is developed by Opus Software Limited. In brief, the program was developed to enhance flight simulation and try to bring it closer to the real world of flight. OpusFSX is designed to operate on standalone systems and networked systems. The program contains several key features. • Live weather engine for live detailed weather as far as the eye can see, instant weather updates and perfect weather and cloud synchronization across all systems. • User friendly camera control, configuration and docking interface for virtual cockpit, 2D cockpit, and external aircraft views. • Additional support for windowed views for systems equipped with multi-screened computer systems. 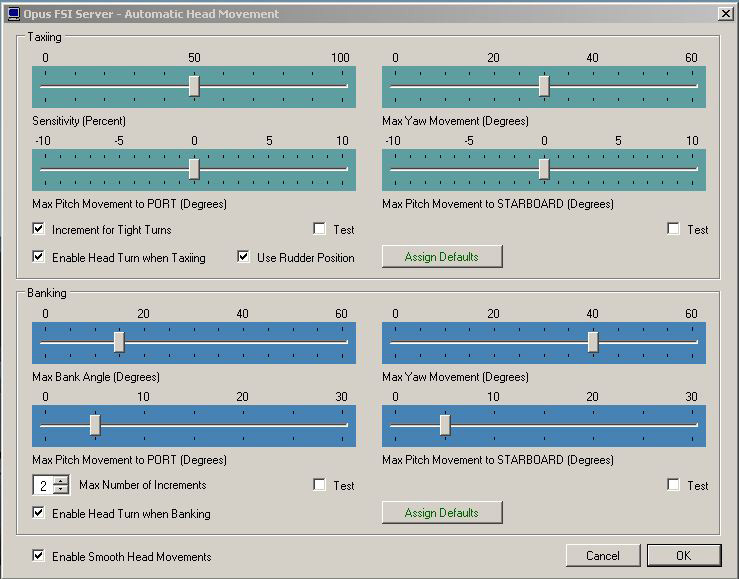 • Dynamic head movements or virtual cockpit camera shake based on actual real-life captured 3D accelerometer data. • Automated head movement to assist taxiing and banking in a turn. • Ultra high performance IPC communications between networked systems. The live weather engine is designed to give accurate, up to date weather from live METAR reports. Create camera views that can be displayed in separate windows and it is designed for multi monitor setups. 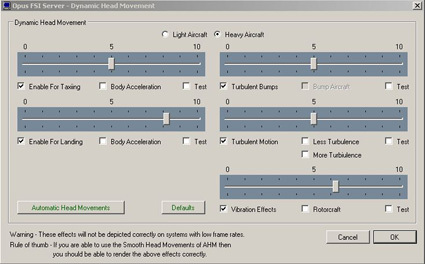 Dynamic head movement adds aircraft vibration and head movement when in turbulent air and on the ground, while landing and taking off. The installation is very straight forward and comes in the Flight1 Wrapper. The installation software is un-wrapped into the default OpusFSX folder or a folder of your choice. You can then do a very quick and straightforward install from the installation program. Once the program is installed into the OpusFSX folder there are several important things to check: 1) You have to have the latest version of Microsoft framework installed, which can be downloaded and installed from Microsoft download centre. 2) You have Simconnect installed. There is a Simconnect install package if needed, inside the OpusFSX folder. Once everything is installed, you need to configure OpusFSX to your own requirements. Inside the OpusFSX folder you will find the Opus FSI Server icon, which will be your main user control panel. I copied the icon to my desktop for easy access. 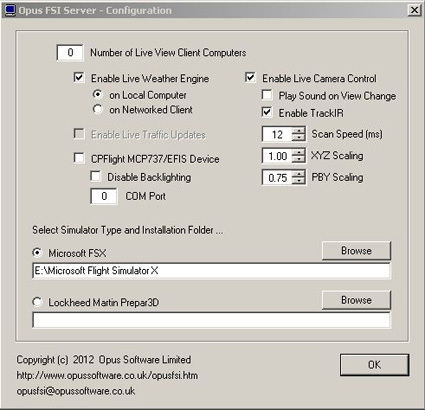 Once opened, this will display the main menu from which you can configure OpusFSX to find your FSX/P3D installation. I found this to be very easy as it was explained very clearly in the manuals provided. If you are a TrackIR user then there are several files to disable in the C:\Program Files (x86)\NaturalPoint\TrackIR5 folder. This is explained in full in the user manual and is very straight forward and quick to complete. OpusFSX TrackIR Interface To activate TrackIR there is another Icon called the FSXTRACKIR which needs to be activated before or after FSX/P3D is started. I did have a minor issue which with this. When I first started TrackIR using OpusFSX, TrackIR stopped working almost immediately, so I found that I had to close it and then restart it using the FSXTRACKIR icon. Once restarted, TrackIR worked with no other issues. I have not seen anyone else discussing this issue on the support forums, so this could be my own system problem and not OpusFSX. 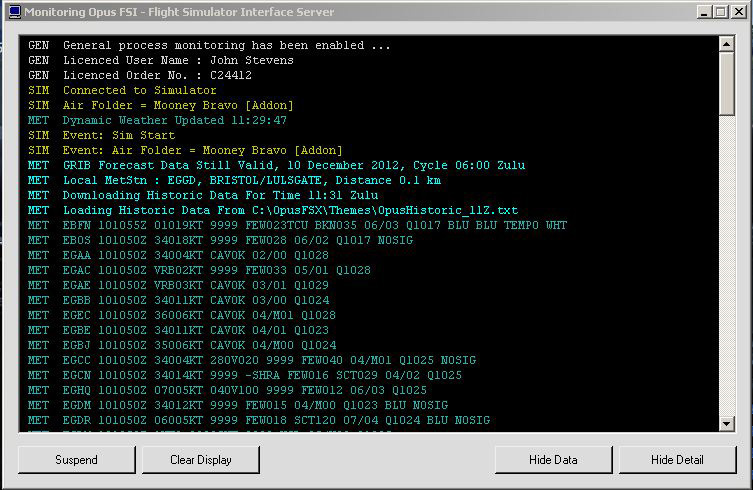 The Live Weather Engine (LWE) is designed to give realistic weather conditions as reported by local weather stations and airports in the form of METAR files. These files are periodically and automatically updated from the station nearest to your present position. 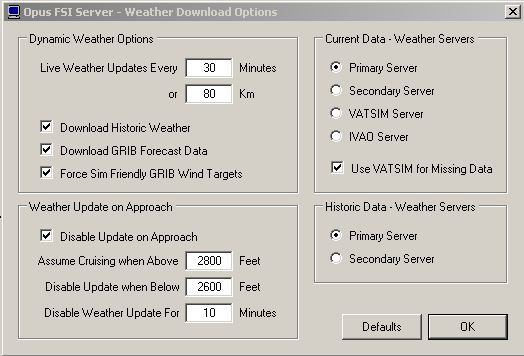 There is an option to download historic weather from the last twenty-four hour period. The Live Weather Engine, as with all other features, can be independently enabled or disabled depending on which features you want to use. Weather Options If you open the weather options, which are located on the OpusFSX server panel, you will have options to adjust the simulated weather to your own needs. The METAR files will not report the presence of cirrus clouds, so OpusFSX will display cirrus clouds by default, however there is an option to remove cirrus clouds. There are also options to disable fog, mist effect and low overcast effect. This allows good visibility to those who like to have clear and colourful scenery when at low level. 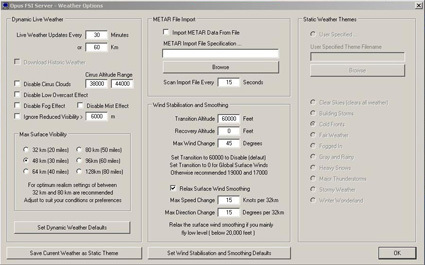 There is an available option to load your own METAR file and also an option to save the current weather as a static weather theme, which can be used when required. OpusFSX downloads and updates the METAR report extremely quickly and with no disruption to your flight. While using the weather engine and comparing it with the local weather, I found that it did simulate the weather quite accurately for my area. The mist and fog looked very realistic and the transition of weather seemed smooth and synchronized. 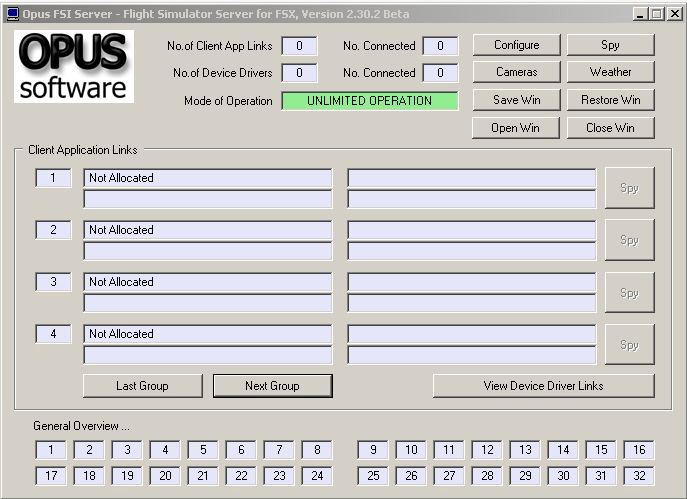 The options that OpusFSX offers when using the Live Weather Engine caters for just about every preference a Flight sim enthusiast could want. 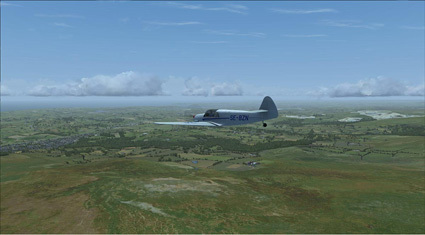 If you fly big and high or the smaller VFR there appears to be an option to suit your requirements. 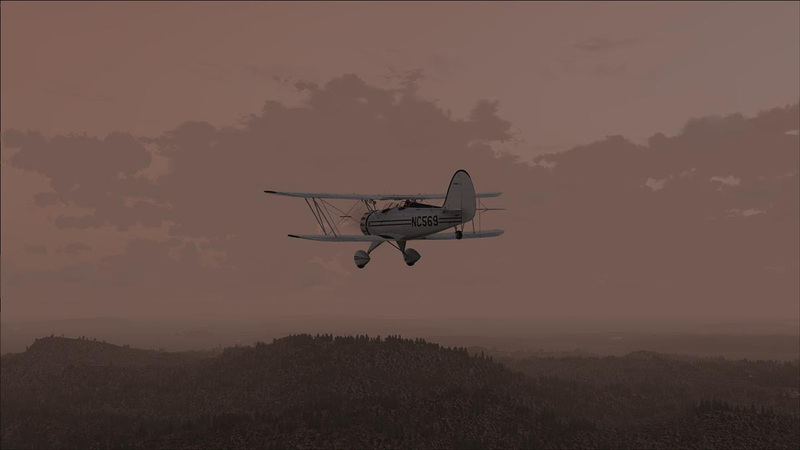 OpusFSX have been improving the weather simulation for higher altitude conditions, trying to provide the user as accurate wind conditions as possible. The latest addition to assist the Live Weather Engine is GRIB (GRIdded Binary) data, which is downloaded. The information is used to help achieve greater accuracy. Weather Download Options The METAR report is normally updated several times an hour and can be even more regular depending on the severity of the weather change. The GRIB report is only updated every four (4) to ten (10) hours depending on when it is out of date. 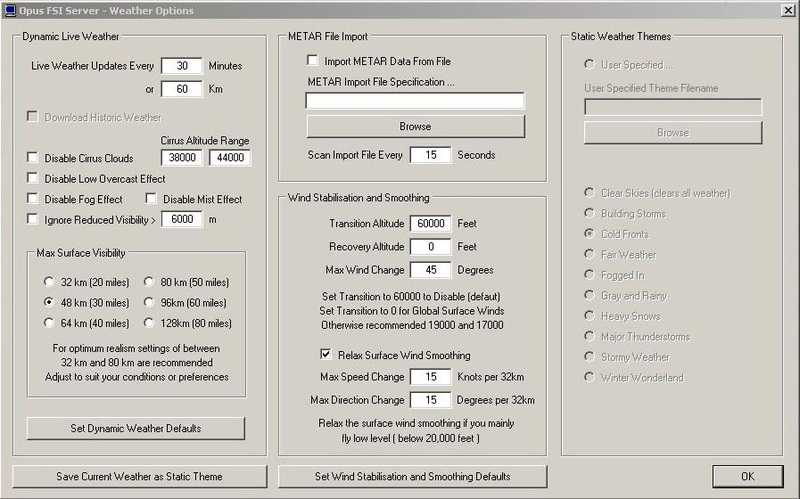 There are more options aimed at achieving accuracy and stability with wind speeds and wind stabilisation, and these are all located on the weather options panel. I observed that the speed with which this software is developing made it challenging to test the accuracy of the data. The figures used at the time this review is being written, do not give a true reflection of the Live Weather Engine's accuracy. By the time this review is completed, the information will be outdated due to the speed of development. However there is up-to-date information from users on the OpusFSX forum, the link to which is posted at the end of this review. 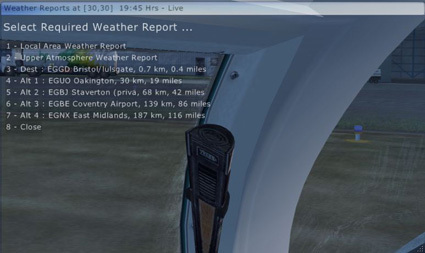 The Live Weather Engine can only be as accurate as the information that is provided on the METAR and GRIB reports, as both are downloaded from free sources on a regular basis. Weather Reports Menu There is a weather report option available. This is accessed through the drop-down menu option. The report can be constantly displayed for your present area as well as several other selected en-route locations. 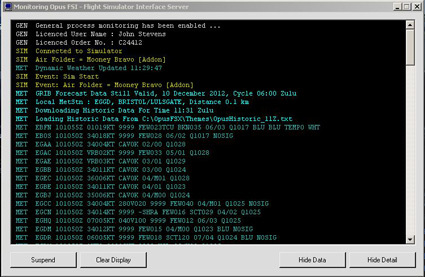 Entering the ICAO code that you require into the weather options screen will generate a report for that location, and this will be available throughout your flight. 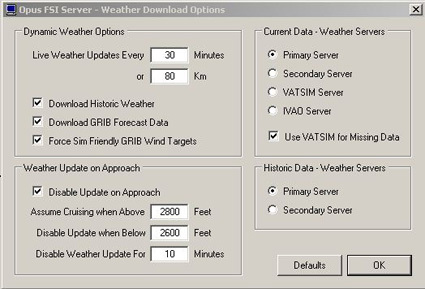 The Upper Atmosphere Report only activates if the GRIB data download is selected in the weather download option panel. You can access the weather reports during the flight from the Add-on's drop down menu on the menu bar. Something that OpusFSX does not have is textures. However there are plenty available that can be purchased separately. There are also free textures which are quite good and do give an excellent effect. The link is available at the end of the review. 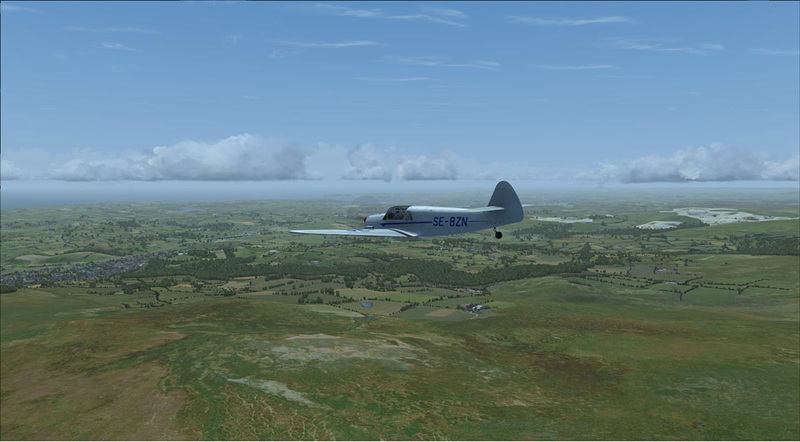 The Live camera feature of OpusFSX does a great job in bringing flight simulation closer to reality. There are several features that can assist or enhance your flying experience. Dynamic Head Movement (DHM) is the head movement experienced inside the aircraft. It is caused by vibration and turbulence. This effect also includes the movement created by ground roll when taking off and landing. To give total accuracy, the movement for OpusFSX was recorded on an accelerometer that was carried on a real aircraft. The DHM does really give a nice feel to the whole experience when flying from the cockpit view. OpusFSX have created a very easy user interface. This interface requires very little input from the user and provides some excellent results. The camera control panel is accessed by pressing the camera button on the OpusFSX Server Panel. 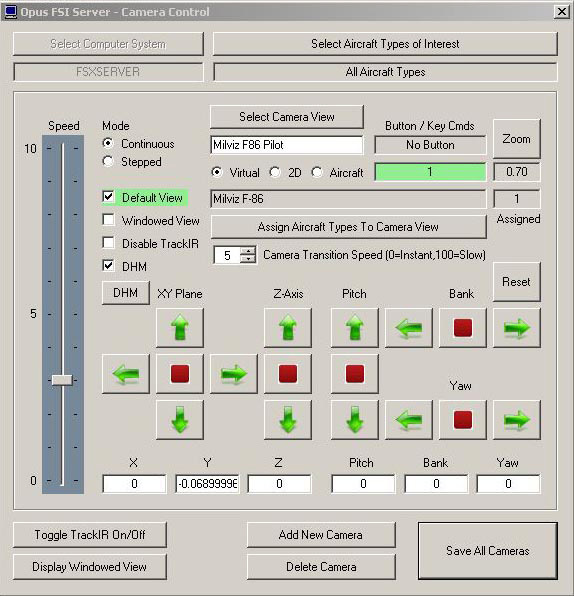 This allows you to set up camera views and adjust the DHM settings for individual aircraft. The vibration effect is linked to the throttle so that by opening and closing the throttle, it increases and decreases the amount of vibration. There is also a Rotary option which increases vibration for propeller-powered aircraft. 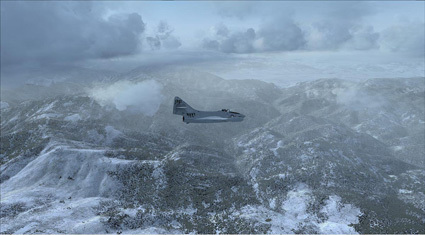 The turbulent motion is linked to weather conditions and cloud cover. Being below or flying into cloud can cause the turbulent effect to increase. There are settings for turbulent bumps which are irregular, aggressive turbulent motions that affect the aircraft and once again, they are reflective of the weather conditions. I found the set-up process for DHM very straight forward and experienced no problems. You will see in the DHM options that there are settings for the heavy and lighter aircraft. The simple slider controls for the DHM settings make it easy to find the right levels for the assigned aircraft. The Live camera feature also has another nice feature called the Automatic Head Movement. This is accessed through the DHM user interface. It basically moves your view from side to side and allows you to adjust the pitch movement while either taxiing on the ground or banking the aircraft in flight. This is a great feature for both heavy and light aircraft, especially if you do not have TrackIR. The amount of movement and the sensitivity can easily be set to suit your needs. 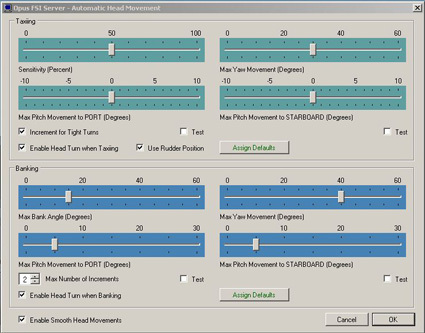 You can also set the degree of pitch experienced on the head movement while banking. Automatic Head Movement Setting up Live Views was easy and how many you setup comes down to the user; you can set up as many as you want and that includes exterior, 2D and Virtual cockpits. The view point of the camera is set by using the green arrow keys in the Camera control option. The settings from the previous camera are the default for the new camera so you can have identical settings for the Pilot and Co-pilot and only have to move the viewpoint everything else stays the same. The speed of transition from one camera view to another can also be set by the user. Switching between views is either by key allocation and/or joystick button. The speed of transition from one view to another is set by a straight forward gauge of zero (0) to one hundred (100); zero (0) being instant transition. Setting up windowed view means you just select the option on the control panel, but you have to load a different aircraft before reloading your original aircraft to force FSX to display the new windowed view. The windowed views will open automatically when you start your flight, but windowed views can be opened and closed from the drop down menu on the menu bar. When setting up cameras using a networked system, with the goal of wanting a view to display on the client system, you must set this in this Camera Control Panel. I refer to the network capabilities in the next section. The video demonstrates the DHM effects, Camera transition, Landing Effects and Automatic Head Movement which are all variable and set with slider controls. One of the features of OpusFSX is the Spy Window, which when opened from the button on the OpusFSX Server panel, gives information all the processes which are taking place. This will not only record what Opusfsx is doing but also FSX in general. The Spy Window displays on screen but closes automatically after ten (10) minutes to avoid using FSX resources. The server facility allows you to run some OpusFSX facilities on another computer. This is so that resources are not taken up on the main computer. 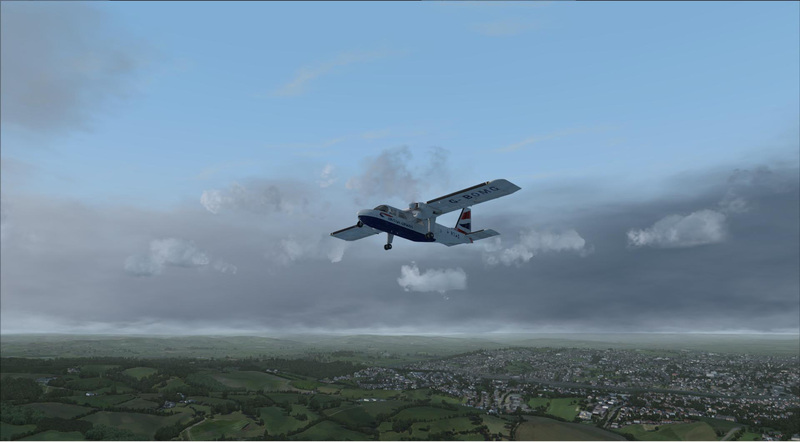 FSX can also be run in full screen and still have other views on a separate monitor. The user manual explains how to connect two computers using a cross-over network cable. The user-manual information is very useful because without any working knowledge of networking, the process can be very frustrating, without it. 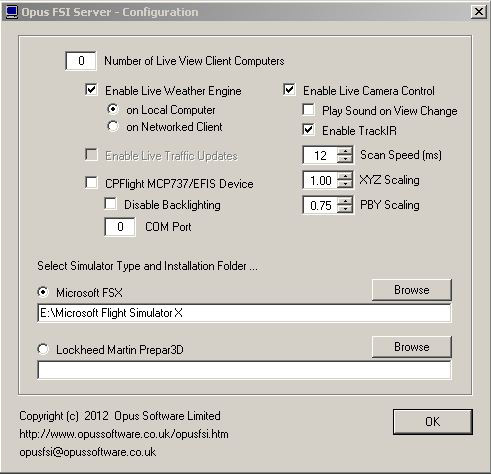 You need to duplicate FSX, scenery and aircraft installations onto the networked client computer. There is no need for a full installation of OpusFSX onto the Client computer. You only need to copy the installed OpusFSX folder from your Main computer and paste onto the C:\ drive of the client computer. Once the network is established, enter the number of networked computers in the live view clients box located on the configuration panel. Once you have followed the installation instructions, the client program needs to be run on the client computer and the server program on the main computer. I found no problems; they connected immediately without any issues. Different views can be set up to display on a networked client computer or a number of computers. If you chose to set up a view and you want it to display on the client computer, you need to select in the camera control panel the system you want it to display on. This sounds complicated, but it is not. It does so with no problems and I found that I only noticed several very minor stutters due to what possibly could have been lag or my client system not quite being able to display the view due to it being only a mid range system. The future plan is for the Live Weather Engine to be able to run on the Client computer, once it has been activated by the developer. I have spent many hours testing and using OpusFSX . I think it would be fair to say that now, I would not consider using FSX without also using OpusFSX. One word I would use to describe OpusFSX is "Simplicity". The manuals are detailed and clearly explain the setting-up and operation for each of its features. I found the Live Weather Engine to be more than comprehensive, using many features to simulate the weather as accurately as FSX will allow. 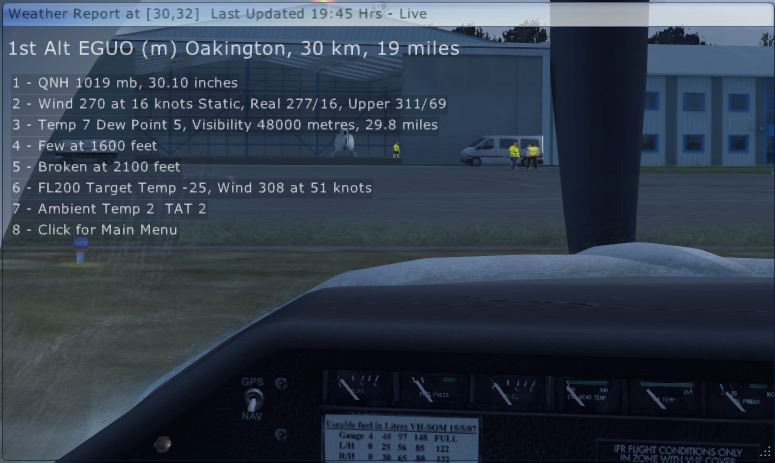 I have even found myself, when flying VFR, switching to another airport for departure after finding the weather to poor too fly from the selected airport, rather than disable the Live Weather Engine in OpusFSX. I found there were inaccuracies in the weather reporting. However before I had chance to investigate them, they were addressed and corrected by the developer, after being reported by users on the Developer’s Support Forum. To acknowledge any of these discrepancies at this time, would not provide a true reflection of the accuracy of the Live Weather Engine due any issues found the corrections were already put in place. However there is plenty of up-to-date information available on the OpusFSX Support Forum. The DHM was simple to set up and once it is set up, it gives consistent and realistic performance. I found that it brought aircraft to life with its very realistic visuals, which in turn gave almost a feeling of movement. If you wish to fly without TrackIR. the Automatic Head Movement gave enough visibility for turns on the ground and also when airborne. I did not have any loss of performance, other than using additional windowed views. If displaying a view on a client system then there is no noticeable loss of performance on the main system. If you access the Support Forum you can see that OpusFSX is an ongoing project. There are many features that have not been yet implemented, but are planned for the future. 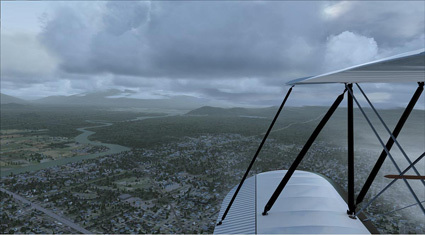 This includes running the weather engine from a server client and a world camera view facility. If you look for the information on the developer’s website and support forum you will find there is more in the pipeline for future development. Another positive note is that as the product develops, it becomes available immediately through the beta update section of the website. Therefore you are not waiting for months for new features to be implemented through updates. In fact I have seen several beta updates in one day. Is it worth the money? - definitely. 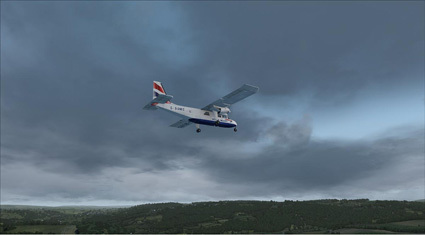 Even while testing and doing the review, I found that it made FSX a completely different flight simulator; one that is far more realistic than I had experienced before. A perfect 10 across the board gives this product an overall Mutley's Hangar score of 10/10! We are also pleased to award OpusFSX the coveted Mutley's Hangar Award for Excellence. Well done to the team at Opus Software.